American and British Islam are dominated by extremists, but Canadian Islam is "different, in a promising and heartening way." So argues Stephen Schwartz of the Center for Islamic Pluralism in "Canada is Different, Even in Its Muslims." That's because "Canadian Muslims are engaged in a debate about their future, which offers an immense contrast" with the situations in the United States and United Kingdom. The diversity and pluralism one finds in Canada's English-speaking provinces results from two main factors, he writes: "immigration by heterodox Shia Muslims from east Africa, including groups known as Khojas and Bohras, who despise extremism and adjust easily to Canadian life"; and Canada's energy independence, which means it has "no incentive to truckle to Saudi Arabia." the reality of the Québécois independence movement. The Québécois feel their culture is threatened by their historic rulers, the Anglo-Canadians. For the Québécois, "accommodation" to other minorities – the term the Québécois prefer to "multiculturalism" – has an ambiguous legitimacy; they insistently define their society as Catholic and French-speaking, first and foremost. Anglo-Canadians and Québécois, Catholics and Jews, Canadian Muslims and non-Muslims, Sunnis and Shias, are now compelled to argue the meaning of reasonable accommodation of minorities. But at least the condition of Islam is being argued, and silence cannot be imposed as in the U.S. and England. This is a necessary step toward the triumph of Islamic pluralism, and one which no moderate Muslim should fear. Canada is indeed different, and may offer hope for other non-Muslim societies contending with the challenge of immigrant and radical Islam. Dozens of irate protesters yelling "shame," "murderers" and "terrorists" shouted down a Waterloo meeting last night. … The protesters, Iranians and Afghans from the Greater Toronto Area, stayed mostly silent during the opening prayers. They shuffled around and held aloft a gruesome photo gallery of torture victims, hangings and firing squad executions they say were taken in Iran. But less than a minute into a talk by a Shiite Muslim cleric from the Imam Khomeini Education and Research Institute in Qom, Iran, the barrage of shouts erupted. One by one at first, then hitting a crescendo of chanting "Down with the Islamic Republic of Iran!" Ayatollah Muhammad Taqi Mesbah Yazdi, head of the Imam Khomeini Education and Research Institute in Qom. 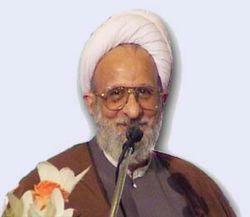 The conference has drawn criticism from groups and individuals who vehemently oppose contacts with the [Imam Khomeini Education and Research] institute because it's director, Ayatollah Muhammad Taqi Mesbah Yazdi, is considered to be an anti-democratic, ultra-conservative cleric who promotes human rights violations in Iran. Yazdi is reputed to be the lead spiritual adviser to Iran's President Mahmoud Ahmadinejad, who has outraged many people by calling the Holocaust a myth and declaring that Israel must be wiped off the map. … Nejati, one of the protesters said the Iranian clerics don't deserve to have free speech because their ideology supports terrorism.